Cycling shoes enable you to pedal more efficiently and with less fatigue, whether you're zipping down the road, cruising over the trails or spinning away in indoor cycling class. You may be hesitant to clip right into the pedals, but with a little practice, you'll appreciate the improvements in fitness and riding power. Cycling shoes feature stiff soles and rigid uppers. The stiffness of the shoe enables you to transfer power to the pedals and provides extra support for your feet so they don't cramp on long rides. Usually, cycling shoes are fitted with clips that you snap right into a compatible pedal. These "clipless" pedals give you a seamless transfer of energy from your leg to the cycle. Just like other athletic shoes, you can find cycling shoes specific to your riding goals. 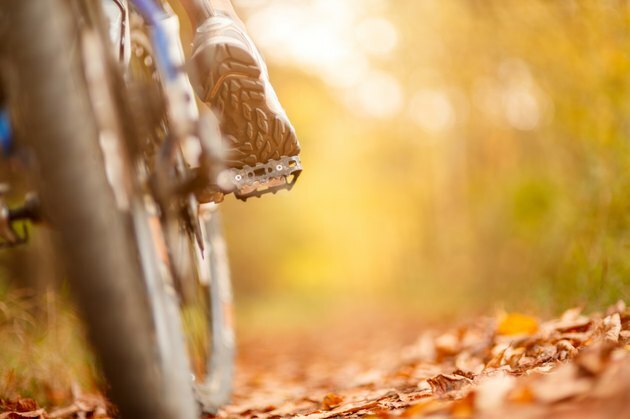 Mountain biking shoes, casual riding shoes, triathlon shoes and road shoes are just some of "clipless" options available. Cycling shoes are usually made from mesh or another breathable product. Air circulates through vents to keep your feet cool. Most are designed to be worn without socks, which also helps keep the sweat factor down. When you're clipped into the pedals, you take advantage of both the up and down portion of the stroke. Pushing down primarily activates your quadriceps at the front of the thighs. You have other strong lower-body muscles, namely your hamstrings at the back of the thighs and the gluteus maximus, that aren't maximally activated if you wear regular athletic shoes. By clipping into the pedals with cycling shoes you can pull up as you push down to generate more power. When you activate the fronts and backs of the thighs, you also promote muscle balance and prevent overdevelopment of the quadriceps. Cycling shoes keep you firmly attached to the pedals so you don't have to concentrate fiercely on keeping your feet in place as you pedal. Instead, your focus is on alignment and power generation, which means a better ride. Because your feet won't slip, you'll also have more control with cycling shoes.